Injured by a driver while walking or biking? We’ll help you get the compensation you deserve. Georgia can be a very unsafe place for pedestrians crossing streets, walking or working along roadways, or in parking lots. It can also be a very unsafe place for cyclists. These accidents regularly occur because automobile drivers are not vigilant in maintaining a lookout for walkers, runners and bicycle riders. These collisions take place despite the caution generally exercised by pedestrians and cyclists. Unfortunately, even a minor collision between a pedestrian or cyclist and any motor vehicle can result in catastrophic injuries, if not death. These types of collisions are all too common on our roads and interstates today. If you or a loved one has been injured while walking or cycling by a driver and you would like to speak with an attorney, please contact us today. We have achieved significant results on behalf of our prior clients in handling such cases. 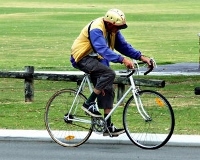 A total of 6,797 cyclists were involved in accidents from 2000-2006. In Georgia, from 2000-2006, 80% of the cyclists involved in crashes were male. From 2000 – 2006, about 60% of the crashes happened on city streets, while the majority of fatalities occurred on state routes. The cause of bicycle crashes has been due to bicyclist error or a negligent or distracted driver. The statistics also show that at the time of their accident, only about 12% of cyclists were wearing helmets, which may have contributed to a greater percentage of head injuries or traumatic brain injury. From 2000 – 2006, 5,078 cyclists suffered injuries in crashes, and 118 people died. The number of pedestrians killed by motorists in Georgia has risen every year since 2001. In 2001, there were 146 pedestrian deaths as a result of being struck by motorists. By 2010, there were 168 pedestrians killed in Georgia. This actually accounted for 13.5% of the total traffic fatalities in 2010, which was 1,244. The pedestrian death rate in Georgia is 25 higher than the national average, which is 1.38 deaths per 100,000 people. Also interesting to note is that while the national average has improved by 19% since 2001, the rate in Georgia has not changed even one percentile. If you or a loved one has been injured while walking or cycling due to the negligence or carelessness of a driver, The Bennett Law Group can help. The filing of a personal injury lawsuit is a complex process that requires specialized knowledge of the legal system in Georgia and specific resources that are not always readily available to the general public. If you have been injured by the recklessness of another through no fault of your own, it may be possible for you to receive compensation for lost wages, medical reimbursement, costs of future medical treatments and rehabilitation, diminished earning capacity, as well as the pain and suffering that you have endured. Contact us online or call us for a free consultation at 404.541.9330. Our bicycle attorneys serving Atlanta and the metro Atlanta area are here to help.